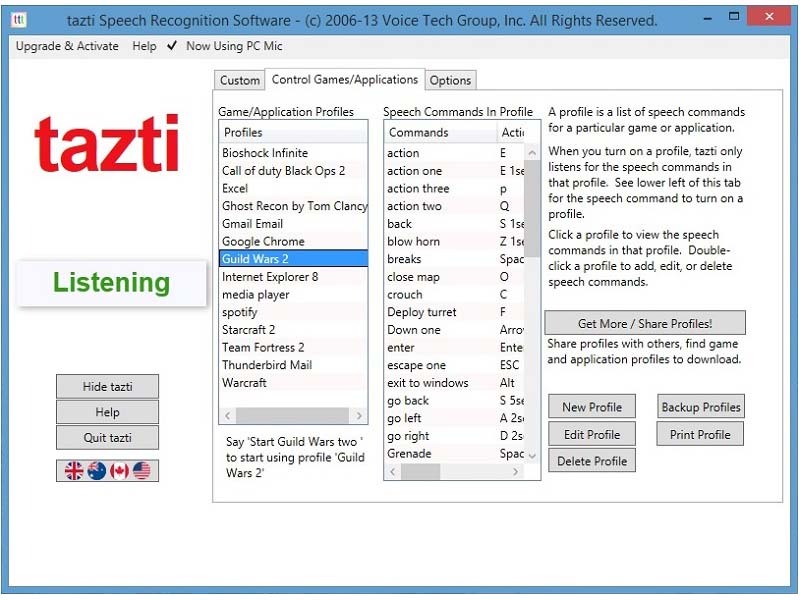 tazti Speech Recognition by Voice Tech Group, Inc.
tazti (pronounced 'tasty') is speech recognition software that you can use to control your computer and play video games on your PC. You can also control programs and applications by voice. Use tazti to control PC video games using tazti game/application speech commands profiles. Use tazti to open websites, directories, files, and programs. Use tazti to control virtually any desktop application or program using tazti game/application speech profiles. Backup game/application speech commands to archive them, or transfer them to other computers running tazti. You can create up to 300 custom speech commands and associate them to open a an operating system action, program, website, file or directory. You can share your game/application profiles for your favorite programs with others, or download profiles created and shared by others. Users can edit or delete any built-in custom speech commands or game/application profiles. Users can customize tazti by choosing what word(s) trigger speech comamands, and what those speech commands do. Users can control Operating System functions by speaking to their PC. These include speech commands such as “mouse click" and "mouse double click” which eliminate the need to click the mouse. Also "Go Calculator", "Go Control Panel", "Go Windows Explorer", "Go Screen Display", "Go Media Player", "Refresh Browser", "Go To My Desktop", "Go To My Documents", etc. Backup your custom speech commands to archive them, or transfer them to other computers running tazti. tazti comes listens by default for U.S. English, but you can change tazti to listen for Canadian, Australian or U.K. English. You can mute tazti without closing tazti, so that you can talk on the phone without tazti listening to you. Users can set their mouse as a right handed or left handed mouse. Users can run tazti on a recent Mac by installing desktop virtualization software such as Parallels, then the MS Windows operating system and then tazti on top of windows. tazti works on Windows 7, Windows 8, Windows 8.1 and Windows 10. (and Mac: see above) You will also need a microphone to use tazti. *Actual requirements will vary based on your system configuration and the applications and features you choose to install. Additional available hard-disk space may be required if you are installing over a network. Feel free to contact us if you have special needs and want a custom designed edition for your business, university or other organization, we will be happy to talk with you.